Hot off the heels of me ranting about the ridiculousness of the base premise of Destiny – I am happy to report I spent most of my rainy, Canadian long weekend playing Destiny. It is not hypocritical to me because as a PVE shooter it is a wonder and a beauty to behold. Which is why I think I get ever so frustrated with the invincible zombie premise. If you are in no danger of dying, as per the video last post, then you are in no danger of losing. Which means just keep dying and pushing through and eventually you will win. There is not a good story premise – it takes out any sort of drama from it. It is a foregone conclusion, story wise. Just keep eating brains, immortal zombie. Man, is it ever such a great game if you ignore that part though. 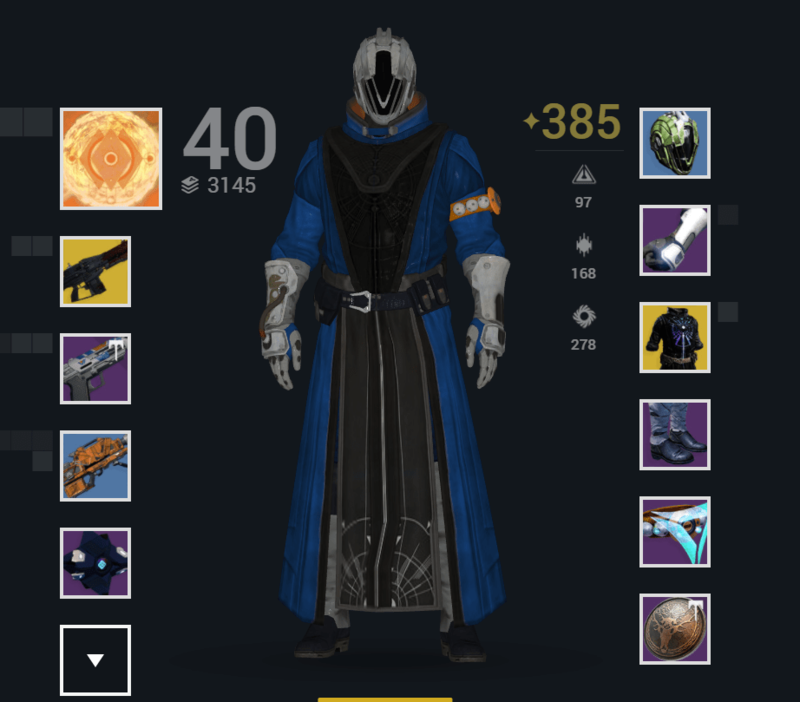 I started the weekend at 320(ish) light level and got to 385. A lot of zen grind in there and I loved every minute. I just had to suspend the provided story and create my own. At 385 the gear grind gets very tight (as a non raider) as only purple engrams (the drops that loot-box into items) give upgrades. And each is giving a 386-387. Which means the going from here on out is just going to get tough and in tiny increments. With the Destiny 2 beta coming in the summer and the game itself in less than four months there isn’t a ton of desire to get to 400. We will lose everything anyway. Still, with being uninspired by other games right now – and not having a “go to” game – it is filling fun gaming time nicely. 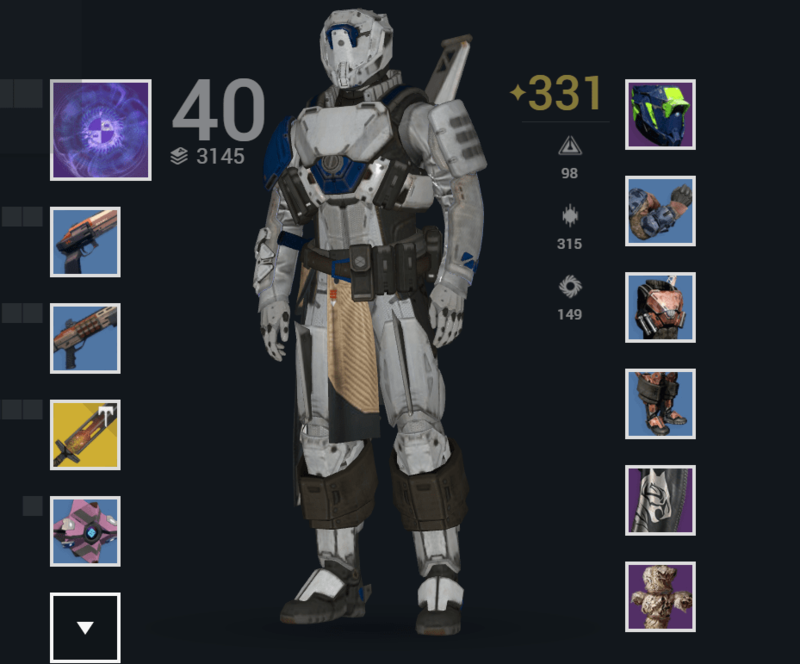 I am now working on my Titan. Of which, I suspect will be my “main” again in Destiny 2. They redid the sub-classes for D2 and the Defender Titan will now have a Void shield (a la Captain America) which they can use not unlike the Captain – blocking things, chucking it to bounce in between enemies and the like. With the armor style above it is not hard to imagine an Iron Man / Captain America combo. It looks like a blast. I hope it plays as fun as it looks. I have never played this, up until last night. My son (now 12) plays it with his friends. I was never a big fan of Team Fortress 2 and other spammy shooters but watching him play a lot made me curious to check it out. I only played against AI to sort through the various characters available and it wasn’t bad shooting mechanics wise but there is so much going on and so little feedback I felt quite lost for some time. For example – I was playing a healer who had the ultimate skill to ressurect any dead team members in the vicinity – but I couldn’t find anywhere if team members were dead. You should have a team profile in a corner somewhere to show who is dead and/or alive, and where they are. At one point it DID tell me two were dead and I am not sure if I missed it the first time or whatnot – so I hit it and it worked, but I was very confused by it. I played bots on Easy and Medium and was fine, got some nice kill streaks and won rounds (as you should against AI, right?) As soon as I put the AI match to ‘hard’ we got destroyed. Utterly and completely. I felt very inadequate. My son did tell me he struggles against those bots too, which was oddly comforting coming from a twelve year old. I am not sure if I am going to continue much – I will try my hand with online play against ‘evenly matched’ humans and if the fact I am a year behind is grossly evident (even at same level) there isn’t much hope of me sticking with it. I know from other shooters high ranking players get bored and start new characters just to auto-faceroll noobs like me. Hopefully Blizzard has solved that problem (which would be VERY EASY to solve) but if not it’s fine – but whether I buy it on PC or not depends on my PS4 experience. Side stepping games – I love the Green Lantern. This is odd because I grew up a Marvel ‘guy’ and didn’t spend much time, effort or money in the DC universe. I do not know where I became interested in Green Lantern but I do remember being in a local hobby/gaming store and seeing “The Sinestro Corps” graphic novel – of which, I heard was quite well done. I bought it and read it – and it IS quite well done. Now I have the desire to learn more and become more deeply involved in the Green Lantern lore. This lead me to thinking of buying other, critically acclaimed graphic novels (Blackest Night) but also look at gaming options. First, and most obvious – is DCUO – a game I have never played. I have installed it but have not fired it up yet (on PC). I have googled tutorials on how to build a Green Lantern character but have also read that you have to buy an expansion first in able to do so. I had this same issue with the Warden class in Lord of The Rings Online – the one character type I was most interested in playing was gated behind an expansion of which, I wasn’t sure I wanted to buy because I wanted to play that character to BEGIN with to decide if I was going to invest in the game. It took me years (literally) to make that decision in LOTRO and I finally broke down and bought the expansion on a big sale to get the Warden. It still remains the only reason why I am considering playing LOTRO, and the biggest motivator for me to dip my toe into DCUO. I am not sure if that is a fair expectation on good old Hal Jordan. The second option is Injustice 2 – the fighting game from the DC Universe which as been reviewed incredibly well – so much so that when I went to go buy it at Best Buy they were sold out of the PS4 version. I didn’t buy it online because I have a $70 GC from Best Buy and wanted to use it for that, so I have held off. I have not played Injustice 1 and I am still mildly hesitant to buy a game for a single character that may be a terrible experience as anyway. That is where I find myself at odds – I am making great money and in a part of my life where I have the most disposable cash ever – but am less likely to part with it on odd grounds – on principle, rather than on reason. Perhaps that is a sign I am getting old. Maybe just unreasonable. Maybe a little from column A and column B.
I still don’t have “that game” right now so remain in an uncomfortable position (like the back of a volkswagon? – bonus points if you know where that is from) of bouncing around half interested in various games, all loaded and ready for me to enjoy at my whim. In the past week I have logged into and/or played (in no particular order or reason) – GW2, LOTRO, EQ, Destiny, The Division and have loaded up many more in the background – Wildstar, DCUO, EQ2. I don’t do well playing the field and need to commit soon for maximum enjoyment. When is Secret World Legends out again? We broke out some games for our rainy long weekend too. Glad you enjoyed it at least. I am normally such a serial gamer and feel much happier and engaged when I am fully involved with one title at a time. It’s also when I do my best analyzing and mechanics digging. I am just glad there is no scarcity right now and have much to choose from. I’m currently trying out Marvel Heroes Omega and Skyforge, both of which recently released on PS4. Despite having played them both on PC in the past, I didn’t get too far into either, and didn’t have any friends playing at the time. My best friend who lives a couple of hours away and I tend to play something together a couple of times a week on PS4 (SMITE, Paladins, etc) so I was looking for something new for us to play together. Beyond that, I feel like both games are very well suited to the console. MH was fine on PC as diablo clickers work well with keyboard and mouse, but the action oriented combat is also fine with a controller, and Skyforge feels built for console. Who knows how long we will play but trying new (old) stuff with friends is always a blast. I have to battle with my 12 year old of PS4 time so have been looking for that PC game to bide my time. I have been sneaking on the PS4 at night though and starting to get a hook on OW. We just got the VR Star Trek game so that one’s being spun out of control. I can only imagine. Is it awesome? Do you post about games at your site?